Earlier this year, Innerleithen was one of six winners in a BT competition to find communities where there was highest demand for super-fast broadband. All the other winners are in England. According to the BBC "BT has announced that Innerleithen is to become the first place in the country to benefit from fibre to premises superfast broadband". More about the BBC News item 'Innerleithen to get fastest broadband speed in Scotland'. That's good for our chairman, David Rudram, because he lives in Innerleithen but it's good for the town as well, because business will be attracted by the availability of super-fast broadband. It's also good for another of our trustees, Gwen Stein, who provides family history research at The Wells, Innerleithen from March till October and maintains a photographic archive of people and events after World War II for Innerleithen, Traquair, and Walkerburn and can help with your research in those localities. Innerleithen was in the news last July, too, when we announced the completion of our Innerleithen Monumental Inscriptions (gravestone inscriptions) volume. The BBC Who Do You Think You Are ? Magazine has announced the launch of the new British Newspaper Archive site. If you live in Scotland, you can register with the National Library of Scotland to access the Burney collection of 17th and 18th century newspapers from Britain and the colonies; 48 19th century newspapers (though unfortunately, no Borders newspapers); the digital archive of the ephemera collection of the Bodleian Library, Oxford; the Times newspaper (1785 to 1985); the Economist newspaper/magazine (1843-2006). If you don't live in Scotland then the British Newspaper Archive may be useful. Use the links to understand more about reasons to search old newspapers and more info about the launch article at the BBC Who Do You Think You Are ? Magazine. See the comments on 'reasons to search old newspapers' if you're interested in Borders newspapers. I’ve just returned from our November open meeting in Melrose. The speaker was Margaret Jeary who talked about the memoirs of George Taylor who was born in Yetholm in 1803 and died in Michigan in 1891. George was the son of a shepherd and grew up in a literate household. He first went to school when he was seven and was taught by a pupil teacher aged 18. He was an avid reader throughout his life and a self-educated man. He became a fluent writer using clear evocative English. George’s journal or memoirs came to light as part of a local history project by Eckford Woman’s Rural Institute. With the help of an IT literate daughter they were first in published on the web. In 2009 “From Kelso to Kalamazoo” appeared in book form as part of the Flashbacks series published by the National Museum of Scotland. (From Kelso to Kalamazoo: The Life and Times of George Taylor, 1803–1891Margaret Jeary and Mark Mulhern Eds: NMS Enterprises, Edinburgh 2009. ISBN: 9781905267279). The book is full of delightful little vignettes of 19th century life in rural Scotland. The author tells of getting drunk for the first time as a teenager after helping with sheep washing. He so disliked the result that he eventually signed the pledge. To save the coach fare he would walk to Edinburgh – 50 miles in around 36 hours. On one trip to Edinburgh he saw an advert for a train trip to Burns Country and in Alloway he met an old lady who said that she was Tam O’Shanter’s wife. Another train trip to the Great Exhibition in 1851 was on a Sunday. George, a devout church man, squared his conscience by handing out religious tracts on the train. George Taylor became a market gardener eventually becoming foreman of a Kelso market garden. He thought about his work carefully and found that protecting potato plants with straw reduced the instance of blight at a time that it was ravaging the potato crop in both Ireland and Scotland, He also observed that there was a connection between water and the spread of cholera. In 1855 George Taylor emigrated to the United States and started a truck farm in Kalamazoo, Michigan. The soil there was ideally suited to celery which he introduced into the USA. Clearly this was a successful enterprise as George was able to return to Scotland twice. On the first occasion he returned with his third wife. In all he had 4 wives and 9 children but all four wives and 5 of the children died before him. Thank you to Margaret Jeary for a clear and interesting talk. Our next meeting is on 26th February 2012 in Melrose when Peter Munro will talk about Saving, Spending and Family History. David Rudram and I had a meeting with David McGillivray of the University of the West of Scotland Social Media project at Melrose yesterday to discuss how Borders Family History Society can use social media more effectively. David reviewed our use of Twitter, Facebook, our blog, our forum and helped us link Twitter, Facebook and our blog together, and made some specific suggestions. Enable more Council members to use our Twitter account and that means taking my name and picture off the account and putting the Borders Family History Society identity and logo on it. Of course, I'll still tweet family history on it but I'll set up a new personal Twitter account, too. Publicise our Twitter, Facebook, and blog on our publications, emails, and website, and provide the information to our online members and friends in more places. Enable visitors to bookmark our web pages. It was a very useful meeting for us. Both David Rudram and I learnt a lot. We'll be making the changes, gradually, over the next few weeks. We would love to have your comments on our progress, and your suggestions for improvements, too. You can comment by clicking the comments link below or via our Contacts page, selecting the 'Comments about the website' contact type or just come and speak to David Rudram or myself at one of our meetings. About a year ago, I blogged about street directories produced both by the Post Office and their availability online at the National Library of Scotland and as maps at AddressingHistory. Trade and street directories are useful in confirming information found in the census or as an alternative to valuation rolls. My recommendation in our Kith and Kin columns in the Border Telegraph and Peeblesshire News newspapers was a collection of freely downloadable Scottish directories , however there’s an easier source on the National Library’s page of Post Office directories, (for Borders localities, choose Scotland). I’ve now discovered another useful website that contains local and trade directories for England and Wales between 1750 to 1919. You can search by decade (1850s to 1910s), by location or by keywords (a combination of location, decade, and other details) and the directories are free to read and print, however you can print only one page at a time. 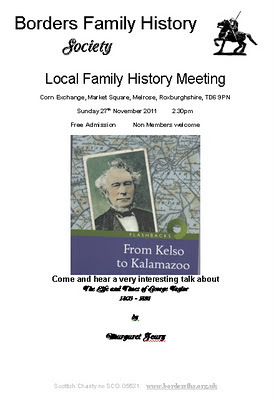 Our next talk is on Sunday, 27 November 2011, at the Corn Exchange, Market Square, Melrose, TD6 9PN. See this map for directions. At the meeting, Margaret Jeary will tell us about George Taylor, who around the age of 50 left a successful career as a horticulturalist in Kelso to start a new bedding plant business in Kalamazoo (once known as Celery City), Michigan, USA. He seems to have been a colourful character and he married 4 times. There's a bit more about him in this description of Margaret Jeary's book, From Kelso to Kalamazoo, but come and hear a lot more on Sunday. The doors will be open at 2pm, with the talk starting at 2.30pm. We warmly invite you to attend the talk whether you are a member or not. Refreshments available after the talk (donation appreciated). Most of us in the UK have family members or ancestors who were born, got married, or died in England or Wales. Unlike Scottish certificates, which can be viewed online at Scotland's People, only the indexes to English and Welsh births, marriages, and deaths can be viewed online. To view the details of births, marriages and deaths registered in England and Wales since 1837, one is forced to buy certified copies of the entries from the General Register Office at £9.25 each. There's no reason why at least the older certificates could not be transferred to The National Archives, scanned and made available for viewing online on payment of a modest fee. We don't need expensive legally certified copies; especially as we may need to see the details of many to help us decide which is the correct one. If you're a UK citizen and / or a UK resident, there's an e-petition to Release historic Birth, Marriage, and Death certificates for viewing online - please have a look and if you agree, sign the petition. It needs at least 100,000 signatures to be eligible for debate in the House of Commons. There's a long way to go, at the time of writing there were only 222 signatures. We've just added our new publications Sales List. Like previous issues, new titles are shown in blue in the sales list. For more information see our blog on Minto Monumental Inscriptions. Parish Registers in the Kirk Session Records £4 - this is new to our list. This 64 page A4 booklet lists groups of baptisms, marriages, proclamations, deaths and burial which were not transferred to the Old Parish Registers of the Church of Scotland, and also parish registers in the Kirk Session Records of Presbyterian Churches in England held in the National Records of Scotland (formerly National Archives of Scotland), and pre-1855 censuses, lists of church members, and rolls of male heads of families mostly held in the National Records of Scotland (formerly National Archives of Scotland). All the above prices exclude postage. To buy any of these, please contact Mary Thomson on the Contacts page using the contact type 'Order for Publications' or see page 11 in our Sales List. Our Sales List also includes diagrams of the parishes within each of the Scottish Scottish Borders counties (Berwickshire, Peeblesshire, Roxburghshire and Selkirkshire) of Scotland. At some point in your family history research, you're likely to find newspapers useful. To find birth, marriage, and death intimations of family members, particularly those who have moved away from the rest of the family. To get detail on events in ancestors' lives. To understand your ancestors' lives in the context of local and social history. To gain perspective on opinion of historical events. To find mentions of ancestors and discover hitherto unknown facts. To find wills relating to ancestors as a lead to their deaths or property ownership. I’ve searched for my family surnames in 19th century newspapers and found quite a lot, however, I will need to cross-check all the articles with other information I’ve found in birth, marriage and death certificates, and the censuses and make sure they are my ancestors or their siblings. I’ve found some items I wasn’t expecting: the marriage of the daughter of someone who I suspect is my 2 greats uncle but who, I was told, had no children; and the marriage of a daughter (previously unknown to me who doesn’t appear in any of the censuses I’ve found) to his brother. I registered with the National Library of Scotland, and I can access the Burney collection of 17th and 18th century newspapers from Britain and the colonies; 48 19th century newspapers (though unfortunately, no Borders newspapers); the digital archive of the ephemera collection of the Bodleian Library, Oxford; the Times newspaper (1785 to 1985); the Economist newspaper/magazine (1843-2006), as well as the full text of a huge number of printed books, and it's all free, because I'm a Scottish resident. Much of it is available online through my computer, but for some of it, I would need to go to Edinburgh, so if you don't have a computer you can access it there. For people not resident in Scotland, the British Newspaper Archive might be useful. I was privileged, last week, to see the beta (test) version of the online British Newspaper Archive. In my view, it was a shambles, it just didn't work properly; I was surprised they had the audacity to charge for it. Their registration process was overly complex, the confirmation emails did not arrive, and though one could login, the archive searches did not work as expected. After several days an email did arrive, though whether it was the confirmation email, I don't know. After clicking a link, one could access a search but the newspaper image was too blurred to read. The help pages weren't helpful, nothing about system requirements, suitable browsers, or troubleshooting. I hope that it will be tested exhaustively on several browsers before it becomes live. I've blogged previously about Australian Trove. Trove has a huge number of Australian newspapers and it's free. I've also written about Papers Past - New Zealand Newspaper Archive. Papers Past provides access to 68 New Zealand from 1839 to 1945, and it's free. If you have a favourite newspaper archive, please let me know. To commemorate Remembrance Weekend, Ancestry are providing free access to their Service Records, Pension Records and Medal Index Cards until November 13th. "WWI Service Records, 1914–1920, provides a complete picture of your ancestors’ military career, revealing their ranks and regiments, where they fought, and many more personal details. It includes over 2 million soldiers who remained in service until the end of the War, or were killed. WWI Pension Records, 1914-1920, actually contains more service records. Its name comes from the fact it was used by the Ministry of Pensions to work out what each solider was entitled to. Here you’ll find almost a million men who were discharged during the War, usually because of injury or illness. WWI Medal Rolls Index Cards, 1914-1920, is the most complete list of British World War I soldiers – as just about all of them were entitled to at least one medal. You’ll find several men with the same names, but you can use this collection alongside the service and pension records and check the regimental number to be sure you’ve found your relative." Whilst out walking this morning with Tweeddale U3A near Drumelzier I came across this memorial at the side of the track. It was attached to a rock with a fine view back down the glen to towards Drumelzier. The memorial is close to Drumelzier Burn about 1km from the B712 at Grid Ref NT 141 334. Scotland on the 'Formosa' which left Liverpool on 18th January 1839 and arrived in Sydney, Australia in May 1839 (see ship arrivals ) with their children, Margaret, Thomas and Robert. Another son, Alexander, due to an epidemic of whooping cough did not survive the voyage and there were two daughters, Mary and Alice who died in Scotland. Their passage on the 'Formosa' (535 tons) under the command of Captain Alexander Adam was assisted under the Bounty Scheme, there were 250 passengers (see shipping intelligence) and the ship's cargo. Thanks to Trove Australia for these newspaper images. The Broomfields were the first settlers of 'Bow Hill', Dingo Creek, Manning River, Australia, but they evidently lived in other locations, too, including Green Hills by Maitland; Upper Patterson; Paterson, Hunters River; Mudgee, Bungy Bungy. It would be nice if these locations were pinpointed - perhaps a reader in Australia can do this ? Also on board the 'Formosa', were Robert and Hellen Wallace, of Melrose, accompanied by their three children, William, Ferguson and Nancy. *Probably flesher, a Scottish word for butcher. Read more of the Broomfield letters. Interestingly, the Formosa doesn't appear on Immigrant Ships Transcribers Guild, and, of course, the Broomfield's departure date is too early for the Scottish Emigration Database because that deals with ships that left from 1890 to 1960. (My thanks to Charlie Denoon, a Society member, who I saw at the Maxton kirk coffee morning and told me about these letters and gave me permission to use content from the article).